Warning: This post may act as a trigger to those suffering/recovering from an ED. This week, February 24th – March 2nd, is National Eating Disorder Awareness Week. I’ve known for a while I wanted to write a post on it, but it’s been very hard for me to figure out the jumble of thoughts in my head about something I feel so strongly about and whether to write on such a personal topic. 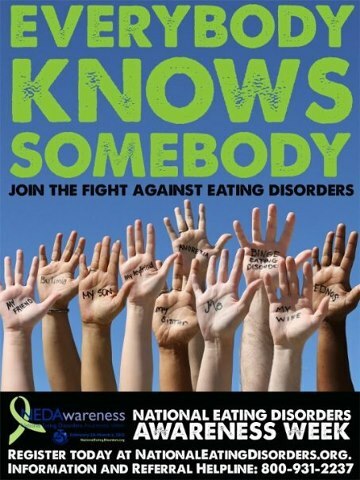 The theme of this year’s NEDA Week is “Everybody Knows Somebody”. With 7 million women and 1 million men suffering from Anorexia or Bulimia (that means 1 in every 200 with anorexia and 1 in every 100 with bulimia) that is almost certainly the case. One of the most important things I feel the need to stress is that an eating disorder is not a choice. Anorexia Nervosa, Bulimia, and “Eating Disorder not Otherwise Specified” are classified mental illnesses in the Diagnostic and Statistical Manual of Mental Disorders (DSM-IV). In fact, these three classifications of mental illnesses have the highest mortality rate of any other mental illness. 5-10% of women with Anorexia die within 10 years of developing the disease, while 8-20% percent die within 20 years. The mortality rate of people with anorexia is twelve times higher than the death rate of ALL causes of death in women 12-24. These are very serious diseases. Yet society today still does not remove the stigma placed on people suffering from these diseases or offer the research and care necessary for prevention. A study conducted by the National Institute of Health in 2011 showed that the average amount of money spent on research per person living with Schizophrenia was $81, for Autism – $44 and for Alzheimer’s – $88. The same study showed that the average amount of money spent on research per person suffering form an Eating Disorder was $0.93. This is a mental illness that needs to stop being ignored. Many people can’t comprehend why people suffering from an eating disorder “can’t just eat” or why they don’t see the sickly state their body is in. To understand that, one needs to realize that the mindset of someone suffering from an eating disorder is not one of someone just trying to look good. That may be how they describe their desired body. It may be how their disorder started, counting calories and restricting food to try to loose weight and slowly spiraling out of control. But a person suffering from an eating disorder truly feels powerless to the control the disorder has on their mind. It is the feeling of worthlessness and disgust that come from putting food in their mouth due to the thought that they should have had the self control and strength to resist the temptation. Not because they fear getting fat, but because at that point it is strictly a mind game equating self control with self worth, thinness with value. The shame and solitude that comes from binging and purging, whether through vomiting or use of laxatives, because they know that what they are doing is wrong, but cannot help the suffocating anxiety and self loathing that fills them until they force it out. To anyone currently suffering from an Eating Disorder, I urge you to seek help either through someone you know or by contacting someone here . It can be difficult to seek help, because you know that treatment will mean forcing yourself, or even being forced, to break from the obsessive rituals that currently define your life. There is the fear of loosing that control, that small bit of reassurance and happiness that you currently have. It seems impossible to have a positive relationship with food and yourself and that may cause you to resist entering treatment. That is not the case. There are millions of people, myself included, who have proven that wrong. Getting past that initial hurdle is the hardest step, but the most important one on the way to recovery and happiness. This entry was posted in Uncategorized and tagged anorexia, bulimia, diet, eating disorder, fitfluential, Food, health, Motivation, NEDA, Recovery by fionaboger. Bookmark the permalink. Thanks for stopping by my blog…we shared the same video! Great to stumble across yours and read your inspiring journey. I live in Colorado, too, so perhaps our paths will cross!